The first of my blackcurrants were ready to pick today. 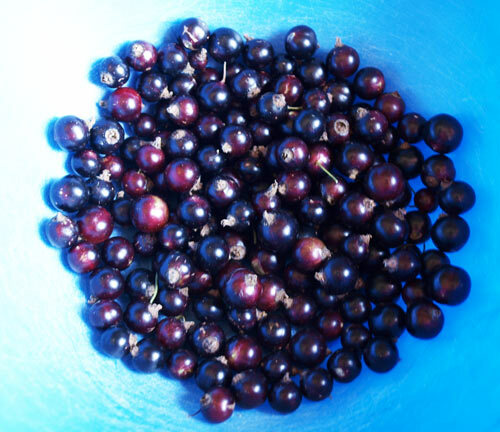 Because we have had a month of rain in Scotland, the currants are nice and large and juicy, we have not seen much sun but today it shone all day and I was able to pick enough to make dessert. After what feels like a very long winter and soggy spring, I need to shed a few pounds so I am lightening my cooking. 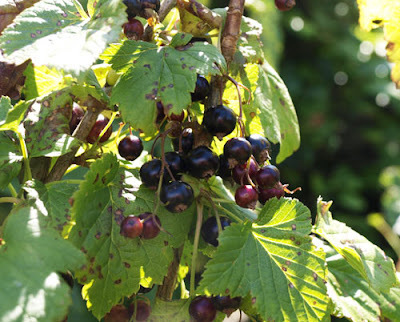 Blackcurrants present a bit of a problem because they are just too sour to eat without some kind of sweetener and I don't like artificial sweeteners. 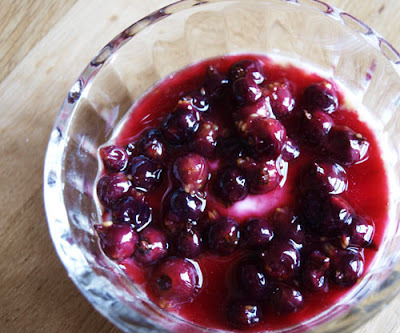 I decided to make a sort of faux cheesecake, so I cooked some blackcurrants (about a cupful) with a teaspoon of water and a tablespoon of caster sugar. I only cooked them until they started to burst then pulled them off the heat to cool. Once cool I added a tablespoon of cherry brandy. In the bottom of the ramekin, is a gingersnap cookie, soaked in a little orange juice to soften it. On top of that is two tablespoons of 0% Greek Yogurt and then the blackcurrant sauce. There was just enough sweetness in the cookie and the sauce to offset the sharpness of the blackcurrants. I'm not saying I wouldn't rather have the full fat version but this was not bad at all. I think this is such a great idea and a wonderful way to use those blackcurrants. Sorry to hear it has rained so much in Scotland. This looks really delicious and healthy. I absolutely love real cheesecake though so I'd have to tell myself it was something else!